Which flavors define Middle Eastern cuisine? The foods that originated from this region of the world are as diverse and exciting as the cultures that live right here in Dearborn. We’re a city proud of the people who make up our landscape. Many of our citizens originally hail from Middle Eastern countries like Lebanon, Yemen, Iraq, Syria and Palestine. When they settled in Dearborn, they brought their spices, cooking styles and incredible home-grown recipes with them. Although TRIA is an American Brasserie, our menu draws its influence from the flavors that make up our community, including those that originated in the Middle Eastern countries our beloved citizens immigrated from. If you’re looking for the best Middle Eastern food in Dearborn, you don’t have to look far. The landscape is dotted with bakeries, restaurants and markets owned and operated by the proud ancestors of Middle East immigrants. Here, we will give you a sneak peek at some of the best Middle East offerings our area has to offer. If you’ve got these ethnic flavors in mind when you come to TRIA, you won’t be disappointed. We’ll clue you in on some of our favorite menu items that draw inspiration from our local Middle Eastern community. If you’re in the mood for baklava or you need to locate a place that sells halal meats, Dearborn has a vast assortment of markets, bakeries and restaurants where you can find all this and much, much more. As soon as you enter these locations, you’ll know you’re in the right spot. After all, the aromatic scents of cumin, za’atar and sumac fill the air. Maybe you’re searching for soft, melt-in-your-mouth pita. Or perhaps you won’t rest easy until you’ve had a delicious kebab. With an array of ingredients, meats and produce distinctive to Middle Eastern cuisine, you’re sure to find what you’re looking for at one of these Dearborn locations filled with Middle East delicacies. At TRIA, we draw our culinary influences from the ingredients and cultures that make up Dearborn’s landscape. Whether it’s sourcing meat and produce from local producers or drawing inspiration from the Middle Eastern community, TRIA is proud to represent our region through food that’s both unique and delicious. We’re also pleased to cater to those of any diet, including patrons who require halal meat selections. Shakshuka: Although initially from North Africa, this traditional breakfast food of eggs baked in tomato sauce is a Middle Eastern favorite. It includes our take on griddled pita. 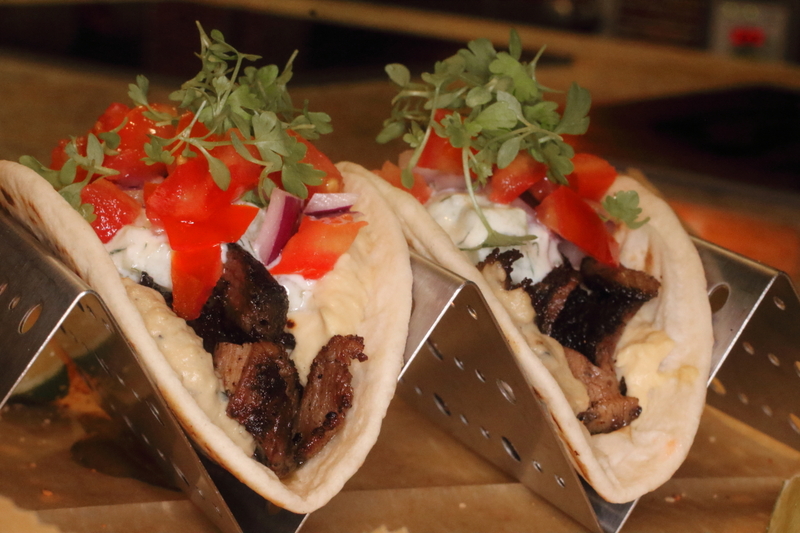 Lamb Taco: This fusion creation blends Hispanic, Mediterranean and Middle Eastern flavors into one delicious dish. You’ll love the exotic flavors of Greek cucumber yogurt and roast eggplant mash. TRIA Salad: When we designed our salad, we were inspired by the tastes of our Middle Eastern community, including whipped feta, cucumbers and goat cheese croutons. 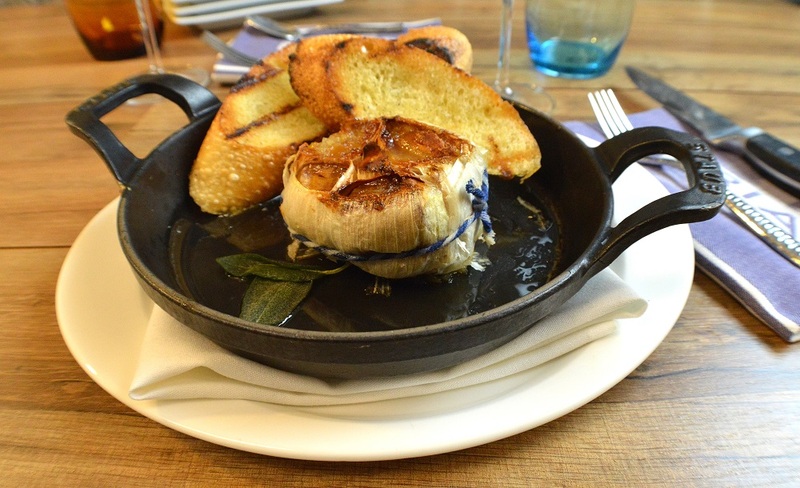 Roast Elephant Garlic: This sharable menu option represents a flavor profile served in many Middle Eastern dishes. TRIA Dips: Another starter option we offer our patrons is our delicious take on classic Middle Eastern dips — hummus, tapenade and roasted pepper feta. House Marinated Olives: Be sure to sample this in-house favorite marinated in exotic spices like star anise and coriander. When you come to TRIA, we want to give you a culinary experience you won’t forget. That’s why we’re redefining what an American brasserie can be. Make a reservation today and experience our take on Middle Eastern fare.